Have you heard of the Fox sisters? The spiritualist movement began on March 31, 1848, in Hydesville, NY, when Maggie and Kate Fox reported making contact with a spirit. Spiritualism is the belief that the spirits of the dead can (and want to) communicate with the living. Spiritualists see the afterlife as a place where spirits continue to learn and develop. If spirits can speak to us, and if they are more advanced than we are, argued the Spiritualists, then surely they can provide us with useful knowledge. Some people were believed to have natural gifts for contacting the dead. They were called mediums, and they held formal communication sessions called séances. Their view of the afterlife divided Spiritualists from orthodox Christianity. The excitement in reference to the mysterious knocking in a house at Hydesville . . . still continues . . . astonishing the multitude. A pamphlet has been published, containing a great number of certificates from individuals . . . who have heard the mysterious knocking, and have propounded to his ghostship a variety of questions, all of which have been answered by raps. The occupant of the house is named JOHN D. FOX . . . and himself and his wife both make a certificate in regard to the mysterious thumping. . . . they first heard the noise about the 30th of March . . . and that it has continued . . . The ghost not only answers all questions put to it, but readily gives the age of each child in the family, and of others in the neighborhood, but the ‘spirit’s’ history of its own affairs is altogether the most marvelous. . . . It states the body it once inhabited was that of a pedlar; that it was 31 years of age, and was murdered about four years since by the then occupant of the house . . . that the first letter of its given name was C, and that of its sir-name B., but it refused to give the entire name, (a very considerate ghost!) The manner in which these questions are said to be asked and answered, is this: For instance, when they wish to ascertain the first letter of its name, the questioner goes through the alphabet, and when the right letter is called, it raps. . . . it was asked who committed the [murder], and each individual was named who had occupied the house . . . No knocking was heard until the name of a very respectable man now residing at Lyons, Wayne county, was called, when it made three knocks . . . so many are the absurd stories about the matter, that the [man in Lyons] has felt constrained to procure a certificate of good character and respectability, signed by some forty or fifty of his former neighbors. . . . [I]ndividuals who have resided [in the Fox house] previous to the present occupants . . . now come forward and . . . certify that they too heard these same mysterious noises when they occupied the premises! . . . [the spirit] says that it shall keep up the rapping until its remains . . . are discovered . . . The peddler’s name was supposedly Charles B. Rosna, but apparently there was no such person, and no vanished peddler of any name was ever identified. In 1904 some bones were found in the cellar of the Hydesville house, but at least some of them were animal bones. All the bones are now considered to be part of a hoax. Kate,12, and Maggie, 15, Fox became a sensation with their exciting story. Family friends Amy and Isaac Post, Quakers from Rochester, took the girls into their home in the late spring of 1848. The Posts became early converts and introduced the young mediums to their friends. 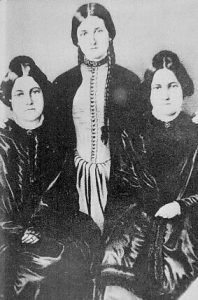 The Fox sisters were soon earning their living by conducting séances, and many people followed them into mediumship. Soon spiritualism became a popular form of entertainment and a serious pursuit for some. The Mysterious Sounds at Rochester and other places. EDITOR: – I observe in the Rochester Advertis[er] two articles, one signed “C.D.” and the other “E.F.,” in relation to those mysterious sounds heard in that city. “C.D.” leads off with a knowing wink, and tells all strangers not to mind any more about this humbug, for we intelligent citizens of Rochester understand it perfectly, but in our immaculate wisdom we do not explain it. . . . Next “E.F.”makes a grand flourish . . . about how the world used to believe in witches and warlocks . . . but has got wiser now and believes in nothing but steam . . . He comes to the conclusion that . . . [the Fox sisters’ séances are humbug] . . . because the spirit constantly calls for dresses, shoes, and all sorts of goodly apparel for the girls. Well, we heard it some time, and never heard any thing of that sort at all. . . . Learned professors at a distance, may insult common sense with their ridiculous theories, but facts are greater than professors, whether they think it or not. . . .
For the most part, it seems, the editor of the Gazette did not believe. He reprinted a piece from the Freeman’s Journal in March 21, 1851: “Spiritual Rappings. This modern humbug is by no means exploded yet.” Further, argued the Journal, spiritualism is blasphemous (we have to accept spiritualism or the Bible, one cannot believe both).
. . . We have seen the Davenport Bros., and thought them very mysterious, but this of the Snell Bros., is far ahead of them . . . Their Dark Séance is entirely different from the Davenports, as they are tied inside a cabinet and a rope is passed around the cabinet and sealed[.] The musical instruments are placed outside [and] perform wonderful antics . . . They will be sure of crowded houses wherever they go. Through the rest of the century the argument raged if scientists and magicians continued to expose fraudulent mediums, and the papers continued to report it, it was because more and more people believed. By 1897 Spiritualism claimed over eight million followers, mostly people from the middle and upper classes. It was especially popular with women. American spiritualists met in private homes for séances, at lecture halls for trance lectures, at state or national conventions, and at summer camps attended by thousands. One significant camp meeting was Lily Dale, in western New York State. Lily Dale was incorporated in 1879 as Cassadaga Lake Free Association, a camp and meeting place for Spiritualists and Freethinkers. The name was changed to The City of Light in 1903 and finally to Lily Dale Assembly in 1906. Its purpose is still to further Spiritualism. Despite many “mediums” being exposed as cheats, spiritualism was very appealing, especially to people grieving for a loved one. Mary Todd Lincoln, for example, held séances in the White House, hoping to contact her son Willie, who died of fever in 1862 (and perhaps also her son Eddie, who died at four in 1850). There was a surge of spiritualism during the Civil War and another during World War I. In 1888, the Fox sisters stated that their contact with spirits was a hoax, and explained how their effects had been produced. One sister later recanted the admission, but the damage was done to their careers as mediums. Spiritualism, though, continued on as though they had never spoken. To learn more about the Fox Sisters and Spiritualism join us on Monday, October 2 at 7 pm when Tracy Murphy, curator and custodian of the Fox Sisters Hydesville Memorial Park in Wayne County, will share the Fox Sisters story and its connection to modern spiritualist beliefs.